This size of kennel is no longer available. We are still shipping accessory items below. This dog kennel is shipped complete in a carton. You can easily assemble the unit using common hand tools and easy-to-follow, step-by-step instructions. The gate is pre-assembled at the factory for easy installation. Quality and durability backed by a two year limited warranty. 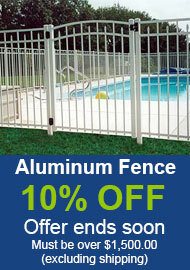 Rust-resistant galvanized steel construction for maximum life and durability. 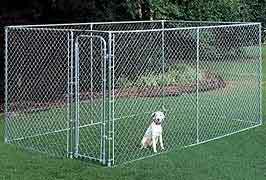 Squared bottom gates help to contain smaller pets. Prevent lawn damage by moving your freestanding kennel. No holes to dig or concrete to pour. Compared to competitive brands, our kennels offer more square footage for the money. shipping charges. You will be contacted before your order is processed. These areas are usually East and West States. Ships LTL common carrier.